A new genus with a single species Thepparatia thailandica Phuph. is described. pistillum superanti, stigmate non lobato, ovario quinqueloculari. Type species: Thepparatia thailandica Phuph. The taxonomy of Rhinolophus yunanensis Dobson, 1872 (Chiroptera: Rhinolophidae) is revised by reference to specimens collected from the provinces of Sichuan and Yunnan, China, and from Thailand. The Thai specimens are found to differ from the Chinese ones in external and cranial morphology and karyotype, and it is thus concluded that what has hitherto been R. yunanensis actually represents two distinct species, including a new one. The new species is described on the basis of 10 specimens collected from Chiang Mai, Thailand. It is the largest species of the pearsoni group of the genus, with a large skull and long ears. Rhinolophus yunanensis is redescribed on the basis of specimens collected from China. In Principal Component Analyses of the cranial morphometric data, the new species was completely separated from the redescribe R. yunanensis and R. pearsoni. Rhinolophus yunanensis [in partim]; Lekagul and McNeely, 1977: 154; Hill, 1986: 15; Yoshiyuki, 1990: 37; Corbet and Hill, 1992: 97; Csorba et al., 2003: 84; Simmons, 2005: 365. Holotype: Adult male, KUZ-M5000 (original collector’s number 1249) from a cave, Doi Chang Kiang, Chiang Mai, Thailand, at an altitude of 1,790 m, collected on 2 February 1982 by Masashi Harada, Song sakdi Yenbutra, Preecha Nunpakdee, and Niphan Ratanawarabhan. Holotype has been preserved in alcohol, with the skull extracted, and is deposited in the Kyoto University Museum, Kyoto, Japan. Meas urements of the holotype (in mm) are as follows: FA 60.39, HB 64.56, TL 24.33, HF 14.15, Tibia 30.02, Ear 29.11, CCL 24.80, IOW 2.90, ZW 14.09, BW 11.44, MW 12.45, UCCW 7.43, UMMW 10.52, UCML 11.41, ML 19.59, and LCML 12.13. Distribution: Rhinolophus thailandensis currently is represented only by specimens from Chiang Mai in northern Thailand. Future comprehensive examinations of specimens referred to as ‘R. 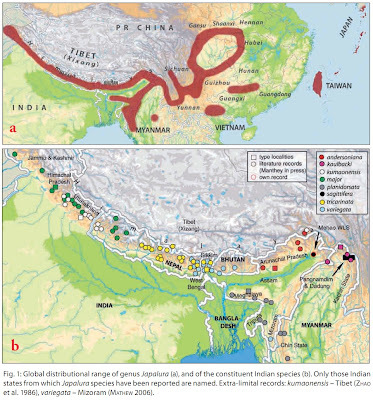 yunanensis’ from the entire distribution range, including China and Thailand, as well as northeastern India and northern Myanmar, need to be performed to correctly understand the distribution of R. thailandensis and R. yunanensis. Rhinolophus beddomei is reported from mainland Southeast Asia for the first time. It was collected in April, 2008, in Ratchaburi Province, Thailand, in a harp trap set over a stream in a dense evergreen forest. Morphometric and acoustic characters of the specimen are given with a brief comparison to other species of the R. trifoliatus group. Currently, it is not clear whether the Thai specimen represents an eastern extension of the Indian Subcontinent population or whether it is a member of an isolated population which is restricted to continental Southeast Asia. It is suggested that a further review, which would involve material from southern and Southeast Asia, together with R. formosae from Taiwan would be of considerable interest. FIGURE 2. 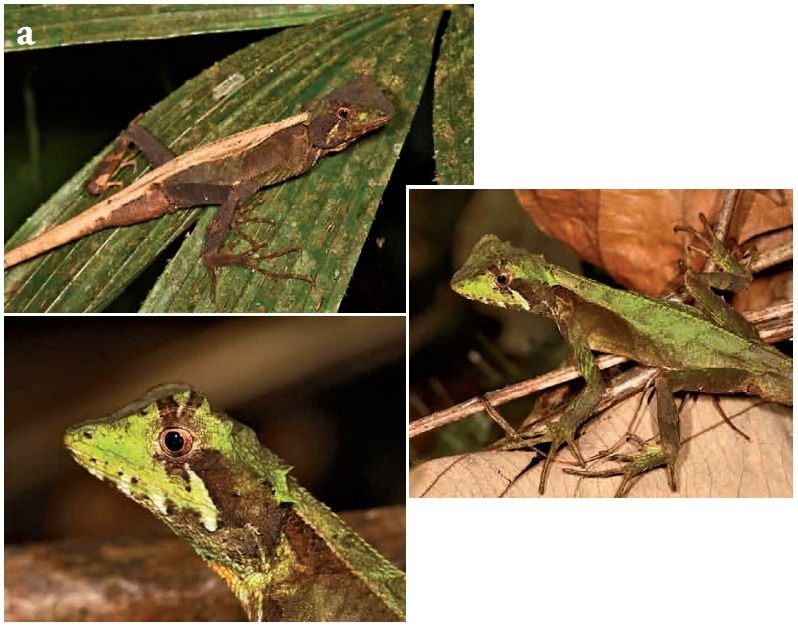 Shape of noseleaf and pelage colour of (A) Rhinolophus beddomei from western Thailand, (B) R. luctus from northeastern Thailand and (C) R. trifoliatus from peninsular Thailand. Ecological and conservation notes.– The specimen of R. beddomei from Thailand was collected in harp trap which was set across a seasonal stream at an altitude of 431 metres (see Methods Section). Since there were apparently no caves in the vicinity, it is possible that its diurnal roost is tree hollows or in a rock crevice. In India and Sri Lanka, R. beddomei was found roosting singly or up to three individuals in hollow trees, small caves and hanging from boulders (Bates and Harrison, 1997). Based on previous information from India and Sri Lanka, the conservation status of R. beddomei is listed as ‘Least Concern’ (Srinivasulu and Molur, 2008). The new material from Thailand greatly extends its known range. However, although Mae Nam Pha Chi Wildlife Sanctuary is officially a protected area, the Sanctuary is still subject to considerable deforestation and hunting pressure. 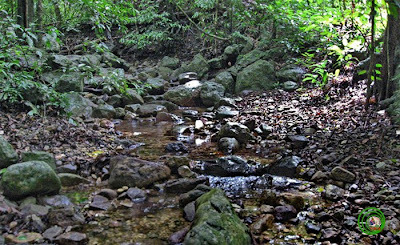 Currently, the Sanctuary, and also other nearby protected areas in southwest Thailand (e.g. Kang Krachan National Park), are being assessed as part of the ‘Wildlife and Its Habitat Assessment in the Corridor Zone under the Biodiversity Conservation Corridors Initiative Pilot Site in the Tenasserim WEFCOM Thailand’ which is a joint project of WCS Thailand and DNP (see www.wcsthailand.org). Soisook, P., Niyomwan, P., Srikrachang, M., Srithongchuay, T. and Bates P.J.J. 2010. Discovery of Rhinolophus beddomei (Chiroptera: Rhinolophidae) from Thailand with a brief comparison to other related taxa. Tropical Natural History. 10:67-79. A new species of the Rhinolophus philippinensis group (Chiroptera: Rhinolophidae) is described from Guangdong, Guangxi, and Jiangxi Provinces in China. Rhinolophus huananus n. sp. is characterized by the horseshoe, as well as by external and cranial characteristics that separate it at the species level from the other members of the philippinensis group. One of the small species of the philippinensis group, R. huananus is intermediate in size between smaller R. siamensis and larger R. macrotis. Etymology: The new species is named after the institute to which the first author belongs, the Institute of Biodiversity in Huanan (=China south), Guangzhou University. subdivisions of Corbet and Hill (1992). In China, both R. huananus and R. m. caldwelli were collected in a narrow range from Yingde City, Guangdong Province (in caves about 10 km apart). These collection data strongly suggest the sympatry of R. huananus and R. m. caldwelli in southern China, although we did not get samples of both species from a single cave. Possible sympatry between R. huananus and R. macrotis may offer additional evidence to support the valid specific status of both species. In that area, R. huananus is clearly distinct from R. macrotis in external and cranial characters as well as baculum morphology. Differences in baculum morphology may strongly suggest the occurrence of reproductive isolation between R. huananus and R. macrotis. Future studies to clarify the detailed distribution of R. huananus and R. macrotis in China and adjacent countries are necessary to explore the evolutionary history of the philippinensis group bats in the southern part of China. Wu, Yi, Motokawa, M. and Harada, M. 2008. A New Species of Horseshoe Bat of the Genus Rhinolophus from China (Chiroptera: Rhinolophidae). A new species of the genus Rhinolophus is described from Yunnan Province, southwestern China. The new taxon belongs to the Rhinolophus “philippinensis-group” and is distinguished by differences in the nose-leaf structures, craniodental characteristics, and bacular features. Etymology: Rhinolophus schnitzleri is named after Professor Hans Ulrich Schnitzler of the University of Tübingen, Germany, in recognition of his outstanding contributions to the study of horseshoe bats. The proposed English name is “Schnitzler’s horseshoe bat”. Distribution: To date, Rhinolophus schnitzleri is only known from the type locality (Fig. 6). 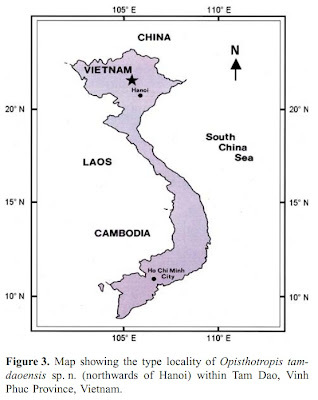 Further studies are required to determine if it is more widely distributed in southwestern China or present in adjacent areas of Myanmar, Vietnam, or Lao PDR. Habitat: Little is known of the habitat preferences or behaviour of R. schnitzleri. The holotype was captured from a cave surrounded by cultivated areas, within a distance of 200 meters to the closest village, and about 50 kilometers to Kunming City. Other bat species captured at the cave during the same night were Rhinolophus macrotis [large form], R. marshalli, R. sinicus, and an unidentified Myotis species. 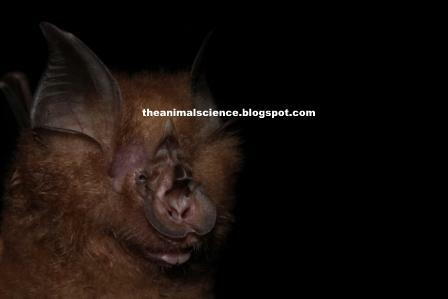 A new species of horseshoe bat (Chiroptera: Rhinolophidae) is described from southwestern China. The presence of a wedge-shaped sella and pointed connecting process of the nose leaf aligns the new species to the landeri group in the Afro-Palearctic lineage of Rhinolophus. However, the new species is distinctly separable from these allopatrically distributed species by its noticeably larger body size. Other sympatric large-sized species of Rhinolophus have rounded connecting processes. Molecular systematic analyses based on mitochondrial cytochrome-b sequences confirmed the affinity of the new species to the Afro-Palearctic lineage, but in a clade most closely related to the ferrumequinum, fumigatus, and maclaudi groups. Of these species, only R. ferrumequinum ranges into Asia and overlaps in distribution with the new species. R. ferrumequinum is similar in general body size and external appearance; however, the new species is distinct in the characteristics of the nose leaf, skull, and baculum. 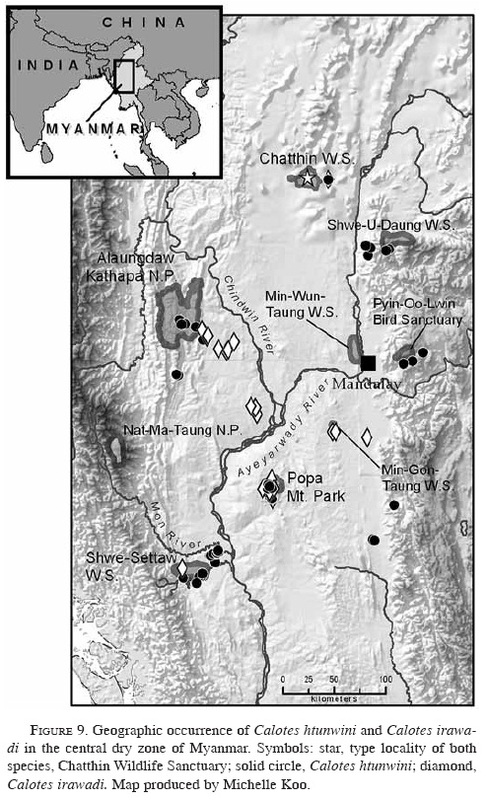 The presence of a new species from southwestern China in the Afro-Palearctic lineage indicates a more complex historical biogeographic scenario within Rhinolophus than previously known. The difficulties found in allocating the new species to one of the phenetically described traditional species groups stress the convenience of using a phylogenetically based systematic organization of the genus Rhinolophus. Distribution.—Known from Jinsha and Suiyang counties, Guizhou Province, China, and the type locality in Yongde County, Yunnan Province, China (Fig. 3). Conservation status.—The new species is a large, distinctive species of horseshoe bat that cannot be easily confused with any other species, and which is known from only 5 specimens collected over a 45-year span in a forested landscape highly modiﬁed by humans and fragmented by farmland. The species is probably rare because there are about 1,200 specimens of other rhinolophids collected from the mountainous areas of the provinces of Yunnan, Guizhou, Sichuan, and Guangxi during the last 50 years and deposited in Chinese museums. These provinces are relatively well represented by records of Rhinolophus specimens compared with other regions in China (Smith and Xie 2008; Wang 2003; Zhang et al. 1997). The species of Rhinolophus most commonly collected in these areas were R. afﬁnis, R. ferrumequinum, R. pearsonii, R. pusillus, and R. sinicus. These species also have been commonly reported from the Himalayan montane areas in the northern fringe of the Indian subcontinent (Bates and Harrison 1997). 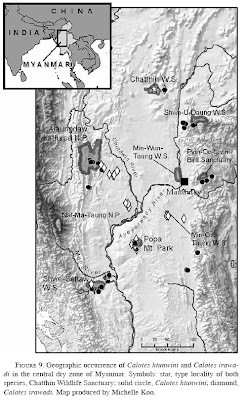 Based on this information, R. xinanzhongguoensis may be a rare species restricted to the mountainous regions of Yunnan and Guizhou. 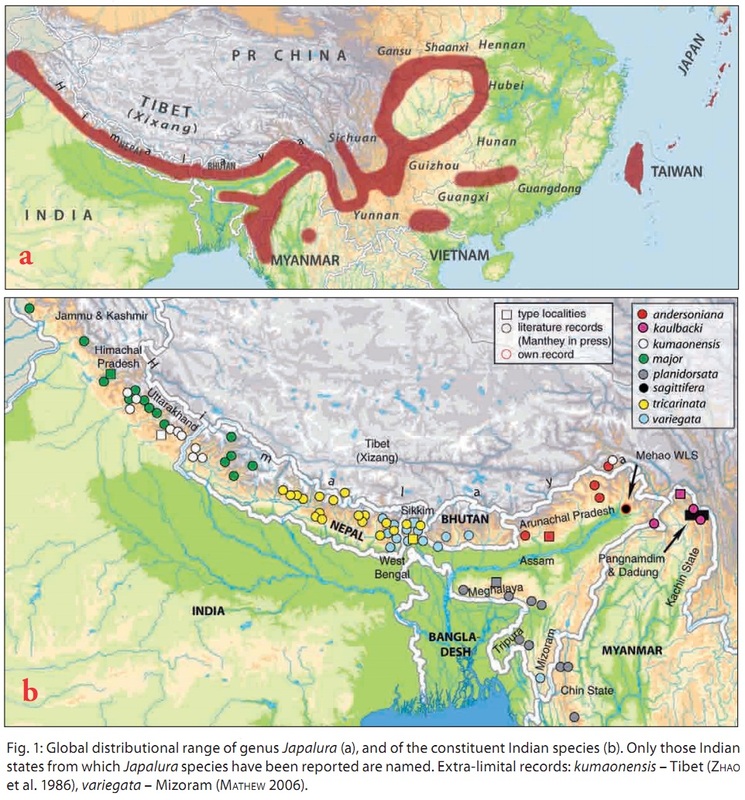 However, some regions around the Tibetan Plateau, such as northern Myanmar, Assam State in India, and western Sichuan, have not been very well surveyed for bats (Bates and Harrison 1997; Struebig et al. 2005; Zhang et al. 1997), and the new species may prove to also occur in these areas. Immediate study is needed to ascertain its geographic range and population size to assess potential conservation concerns and criteria for inclusion on the International Union for the Conservation of Nature and Natural Resources Red List of Threatened Species (Hutson et al. 2001). A new horseshoe bat, Rhinolophus chiewkweeae is described on the basis of specimens collected from the Malay Peninsula. The new species is classified in the R. pearsoni group composed of R. pearsoni and R. yunanensis. Rhinolophus chiewkweeae shows adequate coefficients of differences in external and osteological characters to be separated at species level from R. pearsoni and R. yunanensis. The dimensional characters of the new species except short ears and tail are intermediate between those of the two species. The new species also shows color differences from R. pearsoni and R. yunanensis: the dorsal fur of the new species is orange brown, instead of the dark brown of R. pearsoni and R. yunanensis. Rhinolophus chiewkweeae inhabits a dipterocarp forest of the Malayan division, Sundai subregion, of the Indo Malayan region. A review of the literature relating to the history of bat research in Thailand (1821–2006) is included, together with lists of the 119 bat species currently recorded from the country and the 16 that are omitted for lack of supporting data. The geographical distribution within Thailand of the some of the more significant bat field studies (1896–2004) is mapped and briefly discussed. 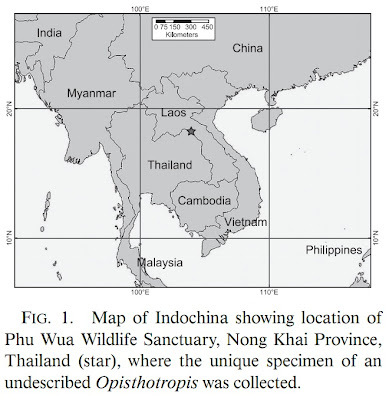 Based on field work conducted in peninsular Thailand in 1993 and 2003–2004, eight bat species (Hipposideros ridleyi, Myotis hermani, Pipistrellus stenopterus, Hesperoptenus tomesi, Murina suilla, Murina aenea, Kerivoula pellucida, and Mops mops) are recorded from the country for the first time; information is provided on their taxonomy, distribution, and ecology. Recommendations are made for further bat studies in Thailand, with emphasis placed on selecting less well known species groups, such as forest bats, in under-researched habitats in neglected geographical areas (for example, the deciduous dipterocarp forests of eastern Thailand and the semi-evergreen forests of peninsular Thailand). A need to develop in-country skills in bat acoustics and taxonomy is also highlighted. 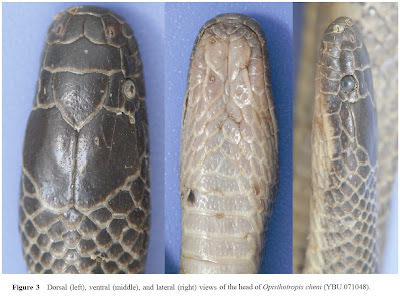 A new species of the snake genus Opisthotropis Günther, 1872, Opisthotropis cucae sp. nov., is described from Kon Tum Plateau in central Vietnam. 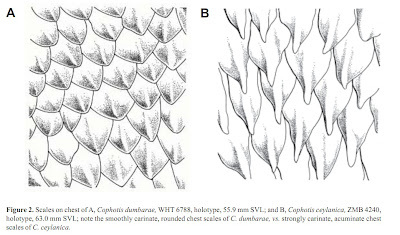 It is distinguished from any other Opisthotropis species by the combination of the following characters: (1) dorsal scales entirely smooth, in 23–19–19 rows; (2) 191 ventrals; (3) 1 loreal, in contact with internasal; (4) 7 supralabials, 5th entering orbit; (4) dorsum uniformly greyish-brown without bands or crossbars, with an irregular separation between dark dorsum and venter, greyish-yellow speckled with dark grey. An extended comparison with other species of the genus Opisthotropis species is provided together with a key to the known species of the genus. Opisthotropis cucae sp. 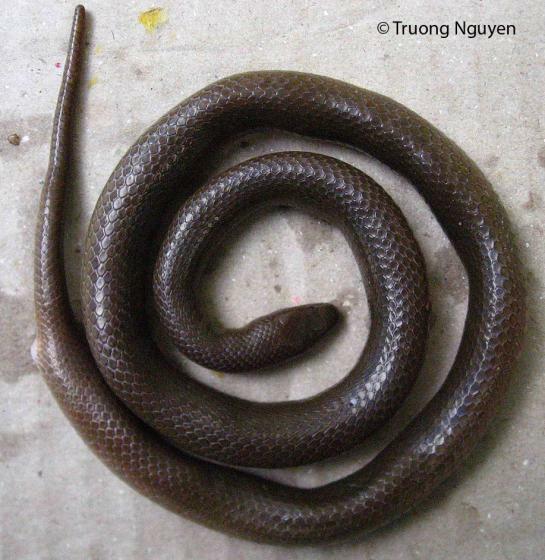 nov. is the third new mountain stream snake described from Vietnam in the past decade. The grammatical gender of the genus Opisthotropis is discussed; this genus is feminine. As tectonic movements in Southeast Asia altered the topography opportunities for speciation increased. Isolation of mountains by valleys, the formation of new drainage systems, and alternating changes in grasslands and forests provided opportunities for restricting gene flow and in other cases brought long separated populations together.The stream snakes of the genus Opisthotropis have speciated in many of the streams to become localized endemics. There are 19 species in the genus and most have a poorly known natural history. Most are found in China and Indochina (Thailand, Vietnam, Laos, Cambodia), but species occur from Sumatra to the Philippines. Only one species is known to exceed a meter in length, most are 0.4 to 0.6 m. Scale ornamentation is unusual with many species having smooth scales over most of the body and keeled scales on the posterior portion of the body, a pattern seen in a few other aquatic and semi-aquatic snakes. And, the keels may be normal looking, serrated, or in some composed of rows of tiny tubercles. Most are probably eating fish, but a few eat crustaceans, and it seems likely that some are more aquatic than others - spending most of their lives in the water and perhaps leaving the water only to lay their eggs. Patrick David at the Muséum National d’Histoire Naturelle and colleagues have now described Opisthotropis cucae based on an adult female, from Chu Mom Ray National Park, Sa Thay District, Kon Tum Province, Vietnam. 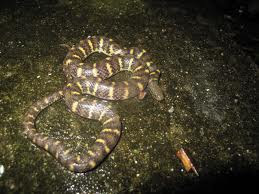 The snake was found at 740 m above sea level in secondary evergreen forest and was collected at night (21:30) under water in a rocky stream. The new species is named in honor of Mrs HO Thu Cuc at the Institute of Ecology and Biological Resources in Hanoi, for having collected the holotype and for her long lasting contributions to the herpetology of Vietnam. This the seventh species of Opisthotropis known from Vietnam. 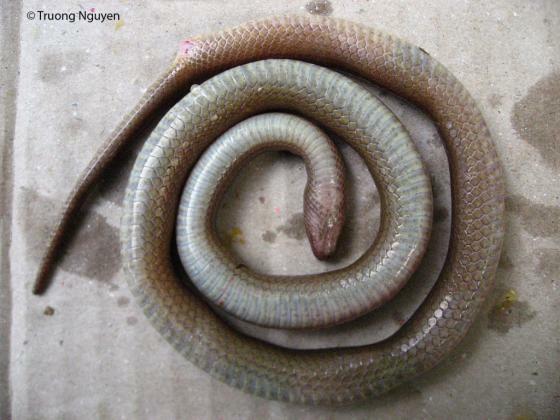 A new species of the snake genus Opisthotropis is described from Tam Dao mountain ridge, northern Vietnam. 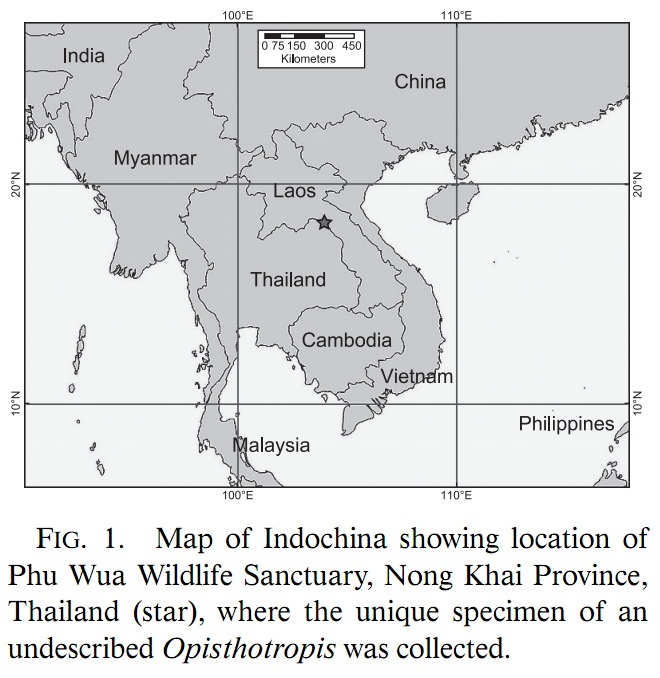 An extended comparison with all known Opisthotropis species is provided together with a key to the Vietnamese species. O. tamdaoensis sp. 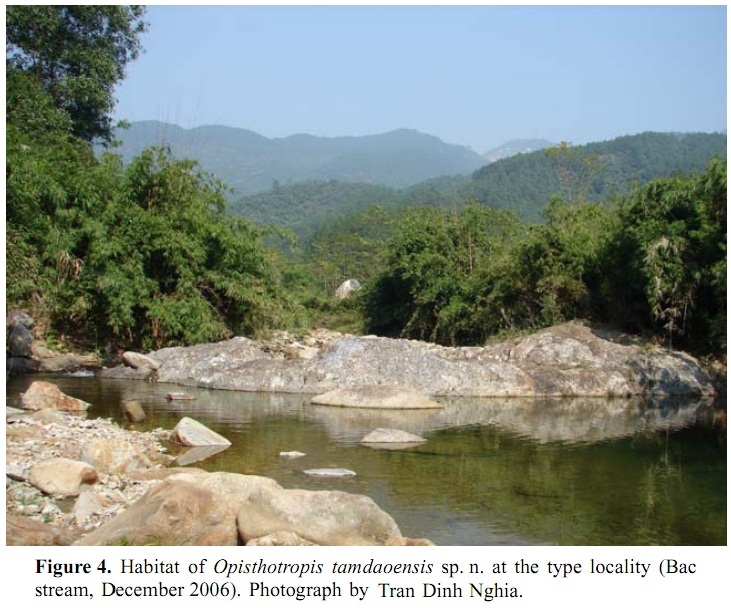 n. is the 20th known species of Opisthotropis and the second new mountain stream snake described from Vietnam in the past decade. Etymology. The specific name refers to the Tam Dao mountain ridge and emphasizes the importance of the Tam Dao National Park for the preservation of the beautiful landscape and its in part unique biodiversity. 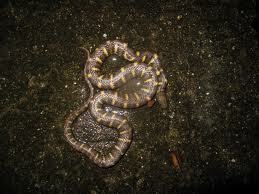 We propose the standard name “Tam Dao Mountain Stream Snake”. Distribution. The new species is known only from the type specimen originating from Bac (Silver) stream in Tam Dao, Vinh Phuc Province, northern Vietnam (see Figs 3–4). 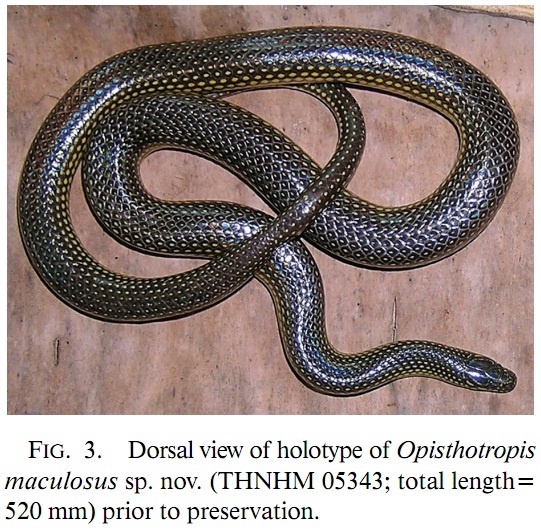 A new species of the aquatic natricine colubrid snake genus Opisthotropis is described based on a single specimen from Nong Khai Province, northeastern Thailand. The new species is distinguished from other Opisthotropis by the combination of having smooth scales on the body and tail, 15 dorsal scale rows throughout the body, the fourth supralabial in contact with the eye, the posterior pair of chin shields longer than the anterior pair, and a glossy black dorsum with yellow spots. Etymology: The specific epithet maculosus (L.) for spotted refers to the distinctive dorsal pattern of the new species. disturbed bamboo mixed with evergreen forest. The snake was very active and thrashed vigorously when restrained. Colubrid species Opisthotropis cheni Zhao, 1999 was named by the author five years ago (see inside front cover of number 3, volume 18 of Sichuan Journal of Zoology), but a diagnosis was given only. In this paper a re-description for the newly known species is contributed, and CIB series-number of three of the types preserved in Chengdu Institute of Biology is also given here. 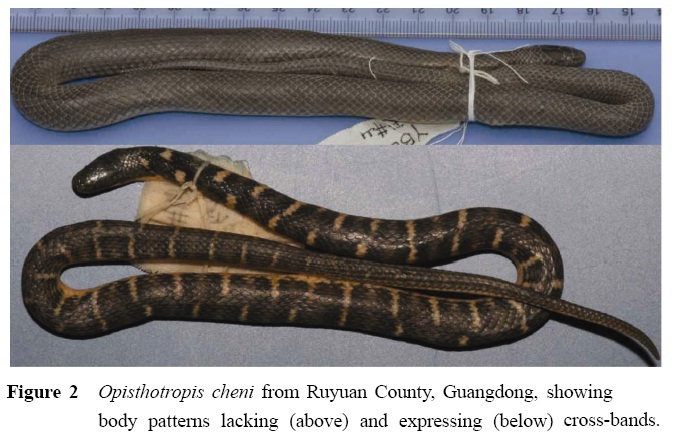 Based on seven newly-collected specimens, we provide an expanded description for the rare Chinese snake Opisthotropis cheni. The new specimens are consistent with the type series in scale counts and body dimensions. However, two individuals lack yellow cross-bands that are apparent in the type specimens. A key to the ten Chinese species of Opisthotropis is provided. 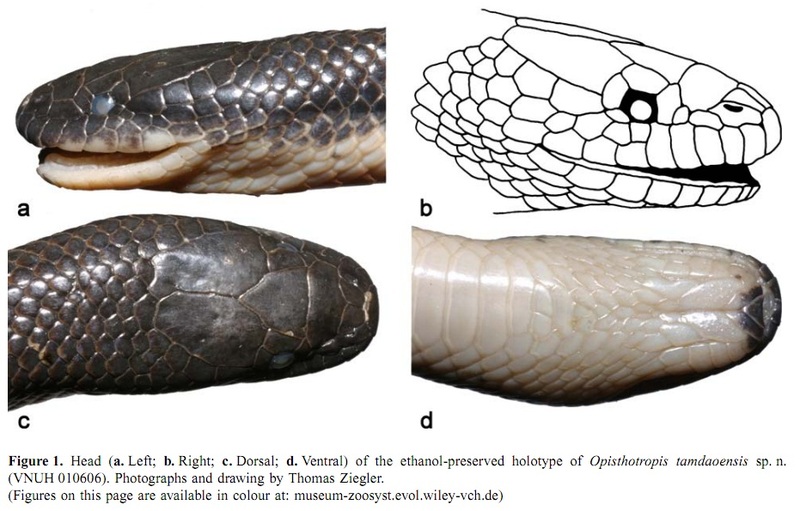 A new species of mountain stream snake, genus Opisthotropis Gunther, 1872 (Serpentes: Colubridae: Natricinae), from the tropical rain forests of southern Vietnam. 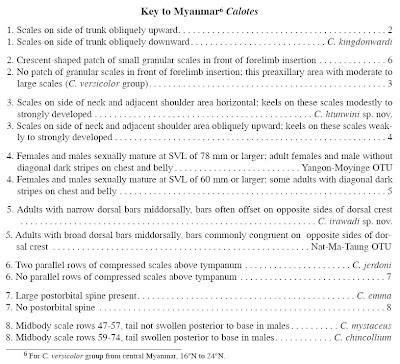 Key words: Snakes, Colubridae, Natricinae, Opisthotropis daovantieni, Vietnam. Orlov, N. L., Darevsky, I. S. and Murphy, R. W. 1998. A new species of mountain stream snake, genus Opisthotropis Günther, 1872. (Serpentes: Colubridae: Natricinae), from the tropical rain forests of southern Vietnam. Russian Journal of Herpetology, 5: 61-64.
collected from Nan Province, northern Thailand. monotypic genus, its distribution, habitat, and diet. 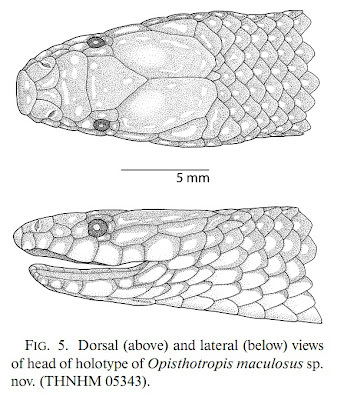 Based upon morphology we remove Paratapinophis Angel, 1929 from the synomomy of Opisthotropis. An identification matrix is provided for identifying snakes in the genera Opsithotropis, Parahelicops, and Paratapinophis Bourret, 1934, all have been considered Opisthotropis at one time or another, and we comment on the status of Opisthotropis. a gravel and sand bar, and shallow water between the bank and the gravel bar. FIGURE 2. The map notes the four localities for Paratapinophis praemaxillaris is known from four localities: (1929) the type locality in Xieng-Khouang, Laos; (1981) Doi Saket, Thailand; (1982) Jindong, Yunnan Province, China; and (2007) the Nan River location in Nan Province, Chaloemprakait District, Huia Gon Subdistrict, at the Wang Pian Waterfalls, Thailand. 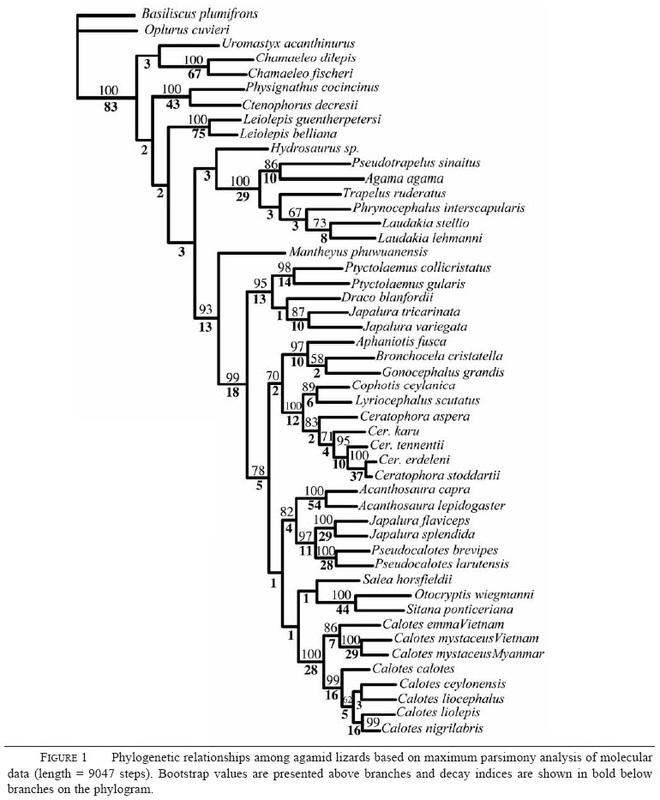 New material of Ptyctohaemus phuwuanensis is described. This rock-dwelling agarnid from Thailand and Laos differs from all other draconines including Ptyctolaemus gularis (the type species of the genus) by having femoral pores, and from all other agamids by having the combination of femoral pores and haired skin sense organs. The taxon is described here as a new genus. Etymology: The genus Mantheyus is named after Ulrich Manthey for his contributions to Southeast Asian herpetology. The specific epithet is derived from the name of the type locality. Type locality: Phu Wua Wildlife Sanctuary, Nong Khai Province, Nong Dem Subdistrict, Bung Khan District, Thailand, 18°15' N, 103°58' E, 200-380 m elevation. Manthey, U. and J. Nabhitabhata, 1991. Eine neue Agame Ptyctolaemus phuwuanensis sp.n. (Sauria: Agamidae) aus Nordost-Thailand. Sauria. 13(4): 3-6 pp. A new species of Ptyctolaemus is described from the Chin Hills, Chin State, western Myanmar. Specimens were found on the slopes of Mount Victoria between elevations of 709 m and 1,940 m in areas of secondary forest in close proximity to human habitation. 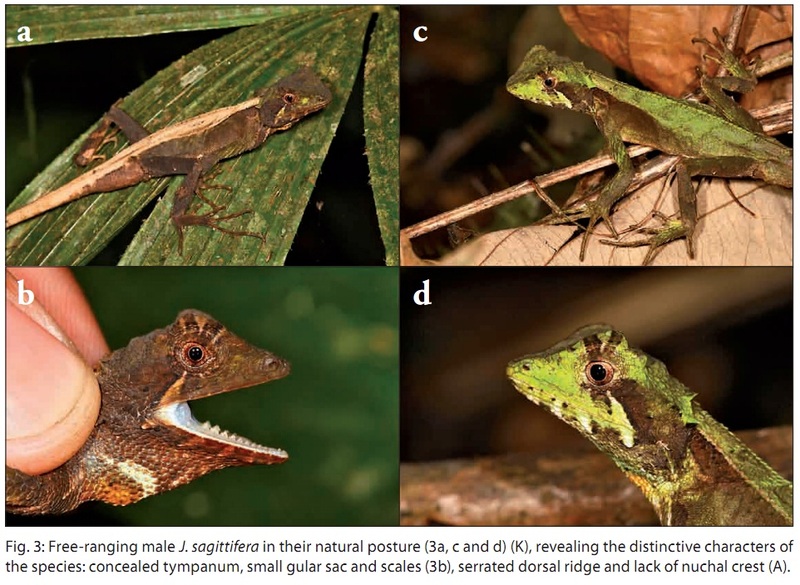 The new species differs from P. gularis, by having a more developed nuchal crest, shorter limbs, larger and more heterogeneous dorsal body scales, and a shorter tail. P. phuwuanensis can be distinguished from P. gularis and the new species by the presence of femoral pores and a distinct gular region. 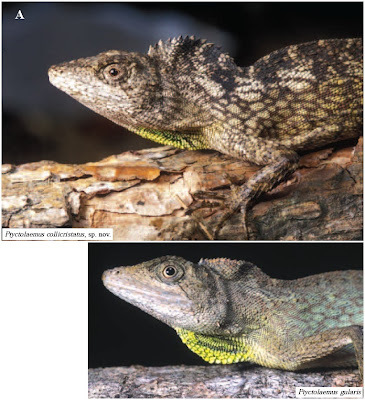 A molecular phylogenetic analysis of P. gularis, P. phuwuanensis, the new species of Ptyctolaemus from Chin State, and other species in the draconine clade indicates that P. phuwuanensis is sister to all other draconine agamids, and, in light of these results, we recommend the recognition of the genus name Mantheyus for P. phuwuanensis. Ptyctolaemus from Chin State and P. gularis are related but different genetically and morphologically representing separate species. FIGURE 5. (A) View of anterior portion of Ptyctolaemus collicristatus, sp. nov., CAS 227489, and (B) P. gularis, CAS 221433. Photographed by Hla Tun and Dong Lin, respectively. ETYMOLOGY.— The specific epithet is derived from the Latin “collum” meaning neck and “cristatus” meaning crested and refers to the nuchal crest. NATURAL HISTORY AND DISTRIBUTION.— Ptyctolaemus collicristatus has, thus far, only been found on the slopes of Mt. Victoria, Chin State, Myanmar (Fig. 8). 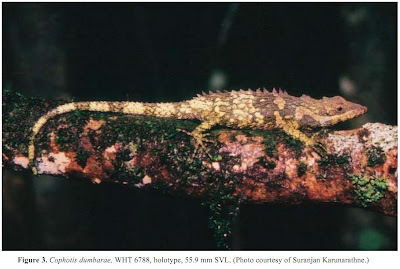 Although thorough surveys in Chin State have not been conducted, recent (July-August, 2003) surveys carried out by the Myanmar Herpetological Survey team in the vicinity of Hakha (northern Chin State) failed to find individuals of either species of Ptyctolaemus. All specimens of P. collicristatus were found in dry mountain forest with deciduous hardwoods and pine between elevations of 790 m and 1,940 m. All specimens were found in areas of secondary forest in close proximity to human habitation. Two specimens were found on trees approximately 2 m above ground, the others were active on the ground. FIGURE 8. The distribution of Ptyctolaemus collicristatus, sp. nov. (closed squares with the type locality represented by a star) and Ptyctolaemus gularis (closed circles represent specimens examined, open circles represent literature records (Huang 1980; Pawar and Birand 2001). Map prepared by Michelle S. Koo. 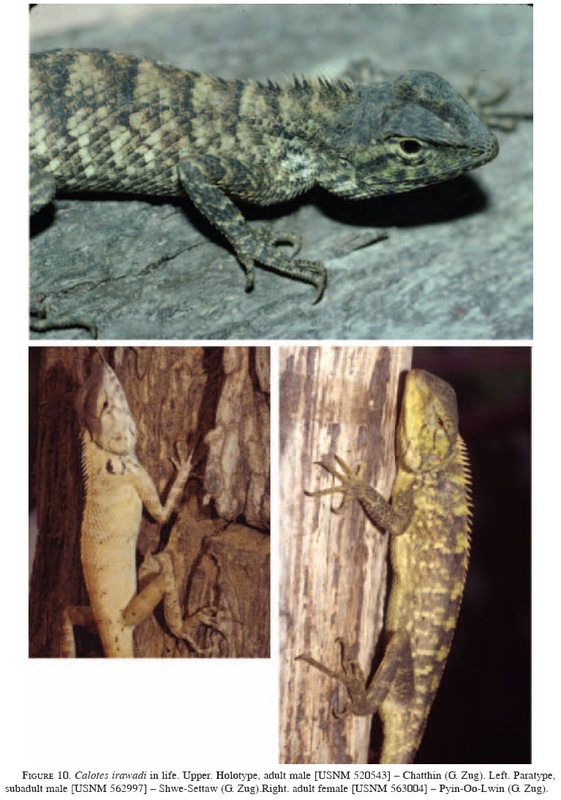 FIGURE 1 Phylogenetic relationships among agamid lizards based on maximum parsimony analysis of molecular data (length = 9047 steps). 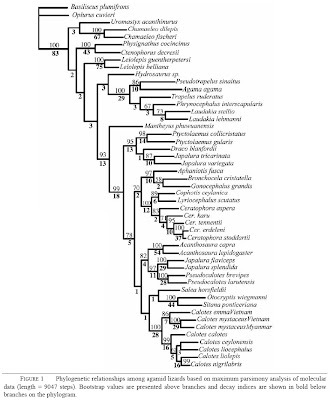 Bootstrap values are presented above branches and decay indices are shown in bold below branches on the phylogram. The Burmese garden lizards represent a complex of several species. 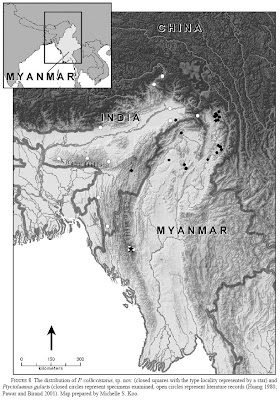 DNA sequence and morphological analyses reveal that two species occur sympatrically in the Central Dry Zone of Myanmar. These two new species are described herein. 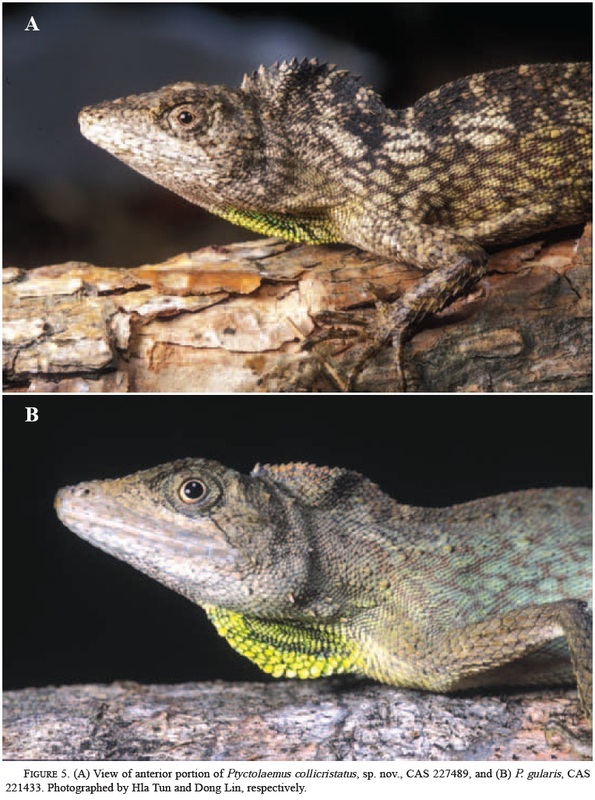 Additionally, the molecular data demonstrate that Calotes versicolor represents multiple species and at least two clades: one from India-Myanmar and another from Myanmar-Southeast Asia. The morphological investigation does not currently recognize unique trait(s) for each clade, but it does establish a set of morphometric, scalation, and quantitative coloration traits that permit statistical comparison of intra and interpopulational variation in the versicolor species group. FIGURE 9. 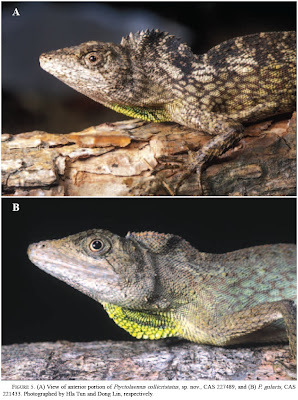 Geographic occurrence of Calotes htunwini and Calotes irawadi in the central dry zone of Myanmar. Symbols: star, type locality of both species, Chatthin Wildlife Sanctuary; solid circle, Calotes htunwini; diamond, Calotes irawadi. Map produced by Michelle Koo. ETYMOLOGY.— We name this species in fond memory of Htun Win and to honor him for his contribution to Burmese herpetology. Htun Win grew up in Chatthin village and joined the Chatthin Wildlife Sanctuary in January 1993 as a day-worker and was appointed as a NWCD forester in January 1995. He began his herpetological work as the team leader of GZ’s Chatthin W.S. herpetofauna monitoring-inventory project in August 1997 and then became the leader of our CAS-NWCD-SI Herpetological Survey team in November 1999. His commitment to our survey project and his expanding knowledge of the Burmese herpetofauna were major factors for the success of the survey. 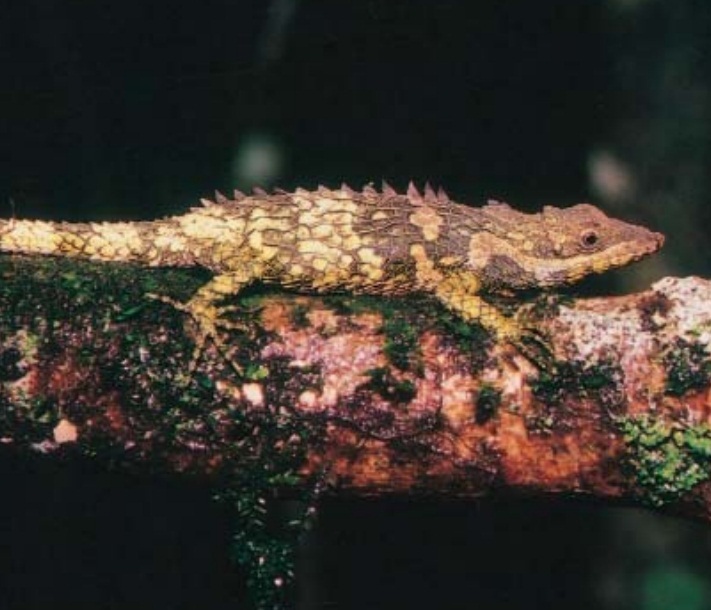 He became ill while surveying the herpetofauna of Kachin State and died in June 2004. The epithet is proposed as a noun in apposition. 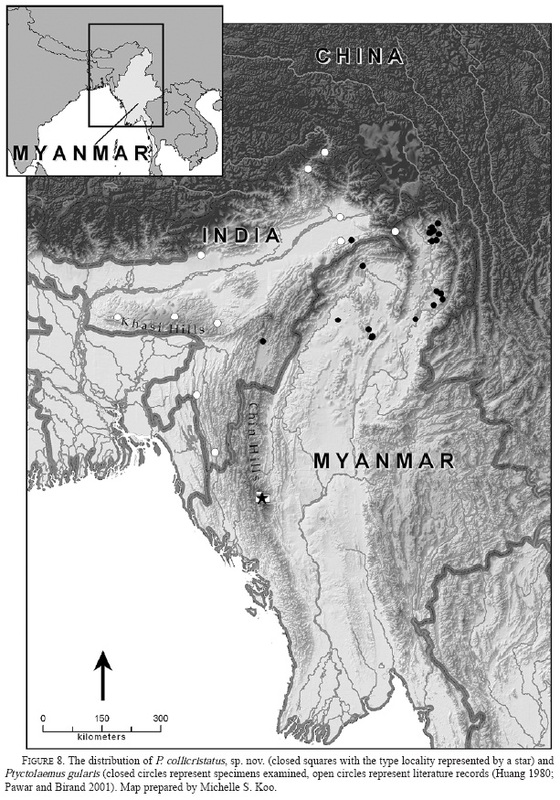 DISTRIBUTION AND NATURAL HISTORY.— Calotes htunwini occurs throughout the lower elevations of Myanmar’s Central Dry Zone (Fig. 9). It is represented by vouchers from Chatthin W.S. southward to Shwe-Settaw W.S. and from Alaungdaw Kathapa N.P. eastward to the base of the Shan Plateau in the vicinity of Mandalay. 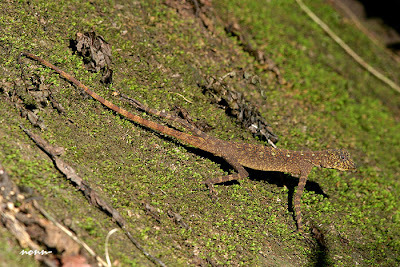 Our field notes indicate that C. htunwini is a forest lizard. 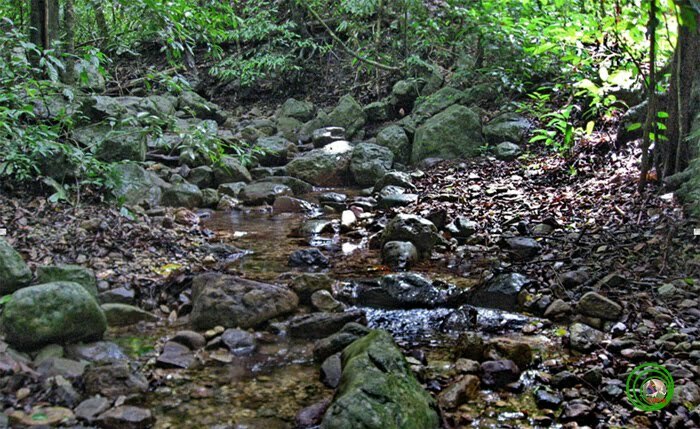 At Chatthin, it occurs within the indaing forest. 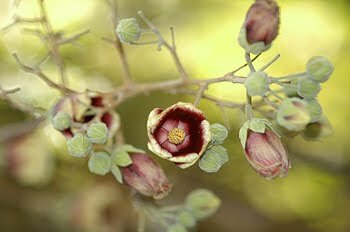 At Shwe-Settaw, it co-occurs with C. irawadi in the scrubby woodland bordering the Namada River. It was also found along a dry forest stream in the center of of the Shwe-Settaw reserve. At Popa and AK, the field notes are inadequate to differentiate between in forest and roadside-agricultural habitats. All the preceding forest records are of open forest, commonly with a scattered grass understory. ETYMOLOGY.— Irawadi is a variant spelling of Ayeyarwaddy and is used as a noun in apposition. Our use of Irawadi refers to the broad distribution of this species in the central portion of the Ayeyarwaddy River basin. 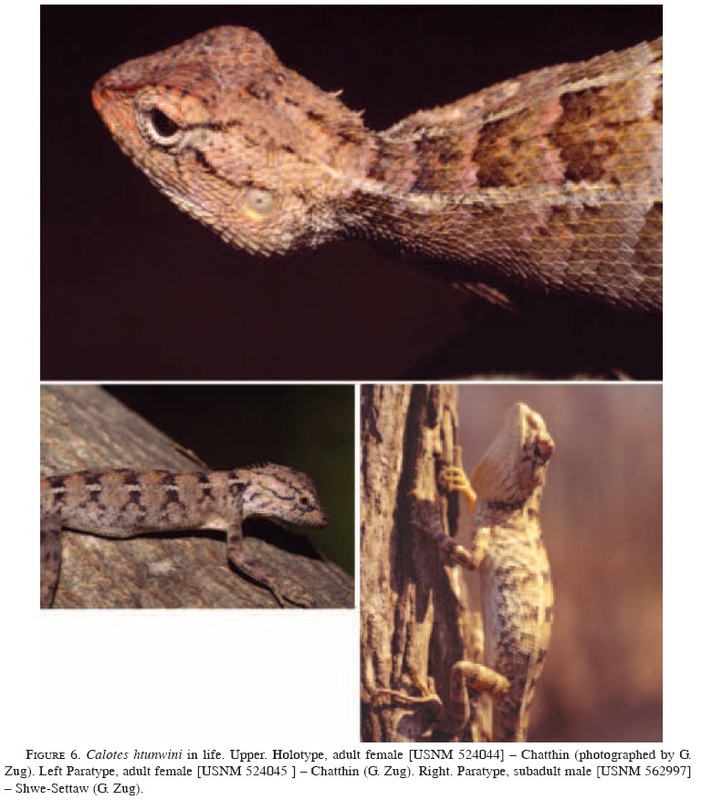 DISTRIBUTION AND NATURAL HISTORY.— Of the two new taxa, Calotes irawadi has the broadest occurrence in Myanmar’s Central Dry Zone (Fig. 9). It is represented by vouchers from Chatthin W.S. southward to Shwe-Settaw W.S. and from mid-elevations at Alaungdaw Kathapa N.P. eastward to edge of the Shan Plateau at Pyin-Oo-Lwin (approx. 1000 m elevation). Field observations indicate that C. irawadi is an open-forest lizard but also persists in fence-row habitats and cut-over woodland. Where it co-occurs with C. htunwini at Shwe-Settaw, the “forested” habitat is patches of secondary growth scrub intermixed with small garden-field plots, and here it was found equally in both the forest and agricultural lands. At AK C. irawadi occurred mainly in forest habitats, at Popa in gardens and in the second-growth scrub adjacent to the more densely forested mountain-sides. Zug, G. R., H. H. K. Brown, J. 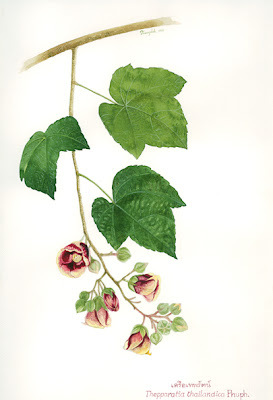 A. Schulte II, and J. V. Vindum. 2006. 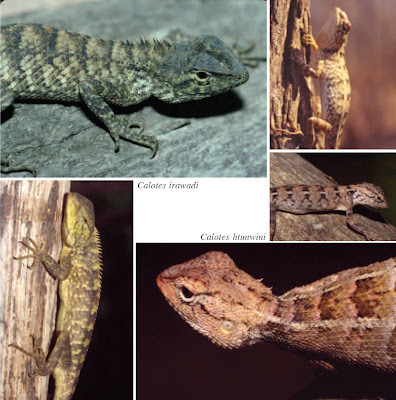 Systematics of the garden lizards, Calotes versicolor Group (Reptilia, Squamata, Agamidae), in Myanmar: Central Dry Zone populations. Proceedings of the California Academy of Sciences series 4. 57 (2): 35 – 68. Kunte, K. & U. Manthey 2009. 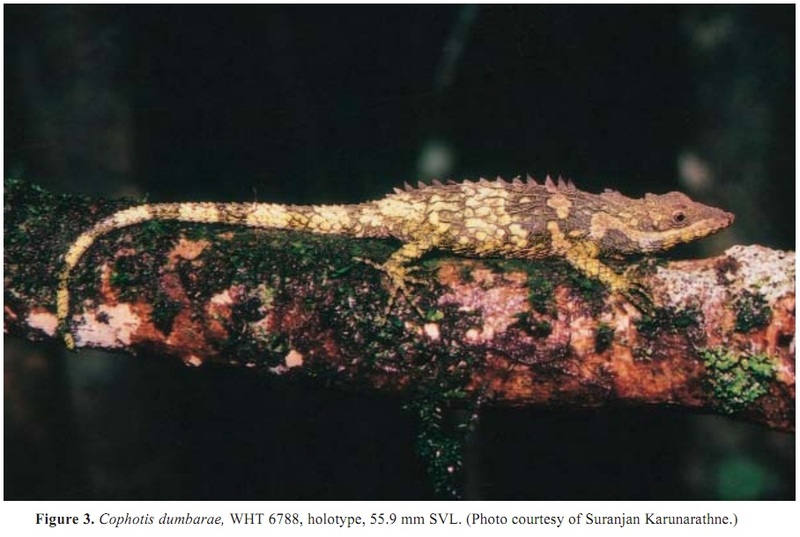 Wiederentdeckung von Japalura sagittifera (Sauria: Agamidae) in Arunachal Pradesh, Ost-Himalaya: Ein Erstnachweis für die indische Herpetofauna. Sauria 31 (2): 49-55. 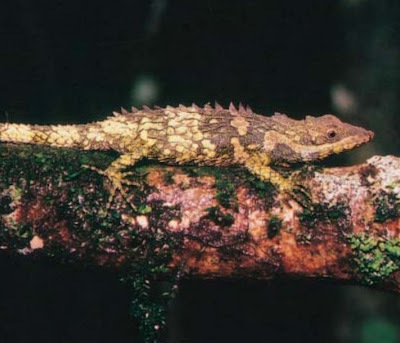 The endemic ovoviviparous Sri Lankan lizard genus Cophotis has hitherto been considered to comprise only a single species, C. ceylanica Peters, 1861, restricted to tropical montane cloud forests at elevations above ~1,700 m in the southern part of Sri Lanka’s central highlands. 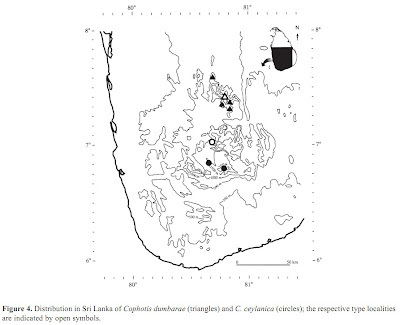 Here we describe a second species, Cophotis dumbarae, from an elevation of ~ 1,400 m in the Dumbara (=Knuckles) Hills, to the north of the central mountains, and separated from them by the Mahaweli River valley (~500 m elevation). The new species is distinguished from C. ceylanica by having a greater mid-ventral scale count (111–120 [n=3], vs. 74– 90 [n=6] in C. ceylanica); non-carinate, granular (vs. carinate, imbricate) mid-gular scales; smoothly carinate, obtuse (vs. strongly carinate, acuminate) chest scales; triangular (vs. pointed) ventral scales; and a less well-developed (vs. well developed) gular sac. Both species reach approximately the same size (65.2 mm SVL in C. ceylanica, 60.0 mm SVL in C. dumbarae), and do not appear to differ significantly in mensural characters. Etymology: The species-name is an eponym for the region it inhabits, the Dumbara Hills of Sri Lanka, formed here as a noun in the genitive case. Figure 4. Distribution in Sri Lanka of Cophotis dumbarae (triangles) and C. ceylanica (circles); the respective type localities are indicated by open symbols. The Dumbara Hills contain a biota with a close affinity to that of the Central Mountains, but with several distinctive, endemic elements. In addition to several angiosperm species, these include eight species of anurans (genera Philautus and Nannophrys), a horned agamid lizard (Ceratophora tennentii), three cyprinid fishes (genera Puntius and Labeo) and five parathelphusid crabs (genera Perbrinckia and Ceylonthelphusa). Some of these are clearly vicars of Central Hills taxa (see Meegaskumbura & Manamendra-Arachchi 2005). The lowlands (elevation ~500 m) of the Mahaweli River, which separates the Dumbara Hills from the Central Mountains, appears to have served as a barrier to the dispersion of highland species between the two mountain ranges, though no attempts have yet been made to date this divergence or relate it to the island’s climatic or geological histories. Schulte et al. (2002) showed, however, that Lyriocephalus diverged from Cophotis ~10.8 mya, and that the populations of Lyriocephalus scutatus of the Knuckles and Sri Lanka’s south-western lowlands diverged ~4.3 mya. Figure 2. Scales on chest of A, Cophotis dumbarae, WHT 6788, holotype, 55.9 mm SVL; and B, Cophotis ceylanica, ZMB 4240, holotype, 63.0 mm SVL; note the smoothly carinate, rounded chest scales of C.dumbarae, vs. strongly carinate, acuminate chest scales of C. ceylanica. Manamendra-Arachchi, K., A. de Silva and T. Amarasinghe (2006). Description of a second species of Cophotis (Reptilia: Agamidae) from the highlands of Sri Lanka. Lyriocephalus, 6, Suppl. 1: 1–8.